Lima’s upscale and expensive Miraflores district isn’t the best place for bargain hunting, especially around the central parks, Parque Kennedy and Parque Central. For typical souvenirs, you'll find many more options at lower prices at the Mercado Indio (Indian Market) along Av. Petit Thouars. But if you like to browse -- and if you’re happy to pay above the norm for Peruvian souvenirs (even after haggling) -- the daily mercado de pulgas (flea market) in Parque Kennedy is a limited but relaxing shopping experience. The small crafts and antique fair is a regular feature in the park. Stall owners set up their wares in the afternoon, with tables featuring an eclectic mix of typical souvenirs and random oddities. Most of the vendors are friendly and happy to chat if they have the time, making it a fun place to explore even if you don't intend to make a purchase. 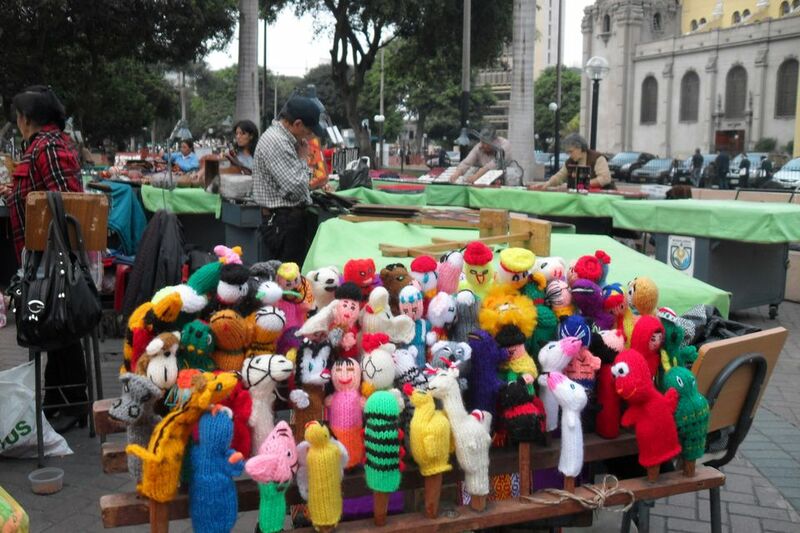 Need a Muppet Finger Puppet From Peru? You’ll find tables laden with Peruvian textiles and colorful knitted items, such as chullo hats, scarves, Andean shawls, and bags of various shapes and sizes. Also, keep an eye out for the ever-popular knitted finger puppets -- everything from Muppets to llamas -- which make great gifts for kids back home. Finely crafted jewelry made from Peruvian silver is also common, with a good selection of bracelets, earrings, and necklaces decorated with traditional Peruvian designs. If the silver is too pricey, you'll also find plenty of handcrafted jewelry at much cheaper prices. Paintings of various sizes are also common at the flea market, many portraying scenes of traditional life in Cusco and Lake Titicaca. You'll also see leather items, such as bags and purses, and traditional handcrafted Peruvian gourds, which make interesting decorative gifts for friends and family. The antique stalls at the mercado de pulgas require a trained eye in terms of defining value. Small cannons crafted from wood and bronze sit among old Peruvian coins and assorted odds and ends. There are carved wooden statues of horses, some carrying rural peasant workers, others bearing the weight of armored Spanish conquistadors. The antiques certainly make for intriguing browsing experiences, but the chances of being ripped off are probably high. It's hard to tell the actual age of these items, and even harder to know if the quoted price is anywhere near realistic. Tread carefully and don't be afraid to haggle. As Peruvian markets go, Parque Kennedy’s mercado de pulgas is far from being a not-to-be-missed shopping experience. You'll find better and far bigger craft markets in Lima and throughout Peru, so don't go spending all your money here -- unless you're short on time and need some last-minute souvenirs. But it's a colorful place with friendly vendors -- as well as a handful of very serious stall owners -- and you just might find the perfect souvenir or travel gift. 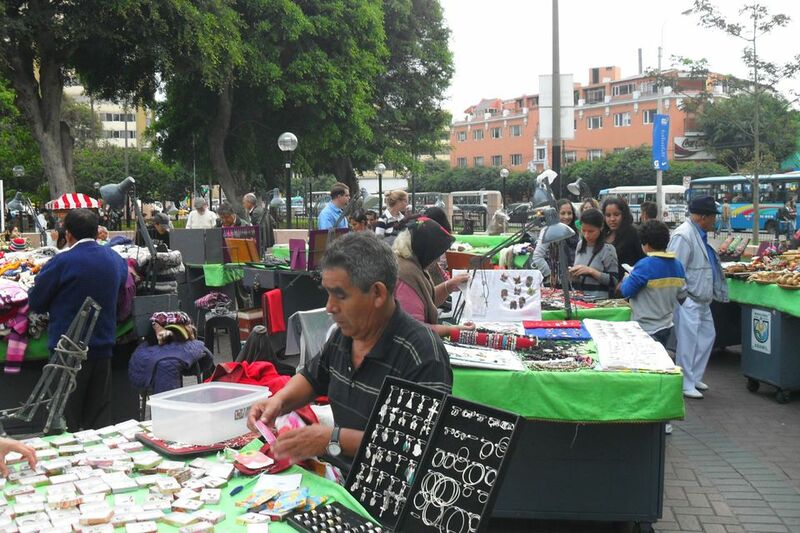 If you’re taking an evening stroll through central Miraflores, the flea market is well worth a quick browse.